Super Bomberman is a classic multiplayer game with simple game mechanics which combine to create a deeply addictive and competitive experience. 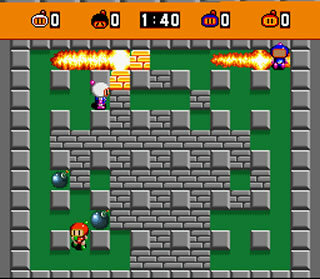 It was released on the SNES in 1993 and was the first game to feature a four player option. The idea is incredibly simple, players play on a map which is like a grid with tiles, at the start of the game some of the tiles are filled with destructible blocks and others have pick ups with various positive and negative effects. Players can drop a bomb with a button press and it will flash for a couple of seconds giving them time to run for cover before exploding and sending a shooting flame vertically and horizontally which will cook anything in its path. 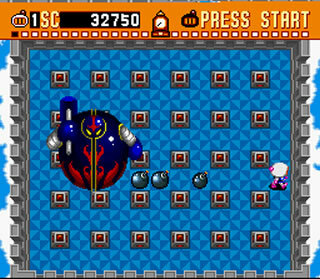 The single player featured six themed worlds each with seven stages followed by a boss fight. Players had to clear each level before exiting to the next via a door which was usually hidden under one of the destructible blocks. In some levels the focus was on killing enemies in others you had a simple puzzle to solve. There was a daft back-story but it added little to the game. While the single player was a fun puzzle and action game the real strength of this title was the multiplayer option. First up was the co-op option where you could play through the single player challenge as a double act. You had to be very careful and communication was key because your bombs would still kill your partner if they got too close to a detonation. This was a fun option but the real genius of the game was in competition. But the multiplayer mode must go down as one of the best modes of gameplay ever made. Battle Mode allowed 1-4 players (human or AI) to face off against each other. You could set up the number of wins required for ultimate victory at the start. Getting into the action you would play on random maps and the last man standing in each round would win a golden trophy. Whoever reached the pre-set number of wins required for overall victory first got bragging rights over their opponents. This was a ridiculously addictive game and I had several epic battles with friends which often threatened to spill over into real life violence. The main point of contention was usually who had been lucky enough to get the best pick ups. There were a range of pick ups available which would modify your character or bombs and they weren’t all positive. My favourite was probably the one that made your character uncontrollably drop bombs and it took some serious skills to avoid blowing yourself up if you were afflicted. As much as the multiplayer could be frustrating at times it was also enormously amusing and provoked much hilarity. Because games were short it was the perfect choice for a quick blast of fun with friends. The graphics were fairly basic blocky 2D sprites and the special effects were less than impressive but none of that mattered because the game-play was so good. The sound effects were decent and the music was actually pretty catchy although you’ll tire of it after a few hours. Super Bomberman was a great party title and it is still terrific fun to play with friends. Easy to pick up and play and hard to put down again this is simple well designed game-play at its best.